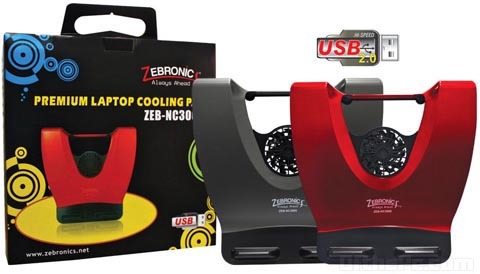 For every process the cooling system plays the prominent role which indirectly a tool grading up the efficiency thus for a long life and here Zebronics notebook accessories has launched its latest addition to it series, the Zeb-NC3000 laptop cooling pad, a cool recliner for notebook computers. is required and this cooling pad is constructed with a very compact size of 8 inches - 15 inches with a good plastic material of resistance with a smooth touch feel. With a 80-mm fan to create an airflow volume of nearly 19 cubic-ft per minute at a speed of 2000 RPM the Zeb-NC3000 comes with a retractable USB cord and there are no other cables or power adapter required with a tight fit angled for supportive usage. The see cool Zebronics cooling pad Zeb-NC3000 costs Rs.950.